By Amanda Silvia, kNOW Research Manager at Critical Mix. She can be reached at asilvia@criticalmix.com. This article is part of a series of on-demand research conducted by kNOW Instant Insights from Dynata, exclusively for the 4A’s. Check out previous articles on organic foods, data privacy, and consumer attitudes towards advertising. Cannabidiol (CBD), a compound found in the cannabis plant, has created considerable national buzz in recent years due to its proclaimed health benefits. The emergence of new CBD-infused products, such as New Age Beverages’ Marley drink line, has resulted in even murkier laws surrounding cannabis-derived products. While marijuana is still illegal under federal law, 33 states and the District of Columbia have passed laws legalizing it in some form. Additionally, with the federal legalization of hemp, hemp-derived CBD products are technically legal in all 50 states. Despite its varying legal status, CBD has definitely sparked the attention of consumers. Leveraging Dynata’s kNOW Instant Insights tool, we asked a census-balanced survey of U.S. adults if their opinions toward marijuana legalization have changed in the last five years. In this short amount of time, public perception has largely evolved: 46% said that they are more open to legalization, and only 8% said they’ve become less open to it. Overall, nearly 50% of respondents said that marijuana should be legalized for both recreational and medicinal use. As consumers’ opinions become increasingly positive, they are exploring other compounds of the cannabis plant, including CBD. Fifty-eight percent of survey respondents said they are somewhat, very, or extremely familiar with CBD, while only 14% had never heard of it. Men are more familiar with CBD than women, with 65% reporting at least some familiarity compared to 51% of women. Adults in age cohorts 25-34 and 34-44 are the most aware, with 70-71% in each group reporting at least some familiarity. Survey members living in the Northeast reported the highest level of awareness of any region, followed by the West. Survey results indicate that there is still a degree of confusion between THC and CBD. In short, both are primary cannabinoids that occur naturally in the cannabis plant. CBD is non-psychoactive, which means it will not result in the “high” typically associated with marijuana use, whereas THC is the main psychoactive component. When asked if they knew the difference between THC and CBD, surprisingly, 50% of survey respondents said that they “more or less know the difference “or “know all about it.” Adults between the ages of 25 and 34 years old were most likely to know the difference between the two compounds, with 61% reporting as such. 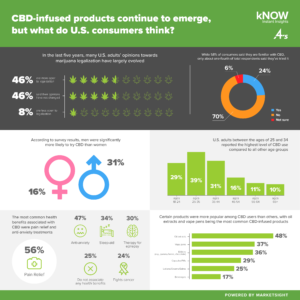 Despite fairly high awareness, only 24% of respondents said they’ve used a CBD product; 70% said they have not. Men were significantly more likely to try CBD than women, at 31% compared to only 16% of women. Adults between the ages of 25 and 34, followed by those ages 35-44, reported the highest usage levels, at 39% and 31% respectively. Overall, most survey participants (45%) said they would not be willing to try any product containing CBD. However, 29% of respondents said that they would be most likely to try an edible. Lotions/Creams/Balms was a close second, at 27%, followed by oil extracts (22%), capsules/pills (22%), and beverages (18%). Of respondents who have tried CBD, 48% used an oil extract. Vape pens was the second most popular CBD-infused product at 37%, followed by edibles (36%), and capsules/pills (29%). Among adults in age cohort 18-24, vape pens were the most popular form of CBD use, whereas oil extracts were most popular for all other age groups. In terms of CBD brand awareness, about two-thirds of respondents had no knowledge of any specific brand. The most recognizable brand, however, was Good Vibes, with 13% reporting awareness. Despite the large percentage of survey participants who said they wouldn’t try CBD, surprisingly, three-fourths associated it with at least one health benefit. The majority, 56%, mentioned pain relief. Anti-anxiety was the second most common, at 47%, followed by sleep-aid (34%), and 30% said therapy for epilepsy. Adults in age cohorts 18-24 and 25-34 were most likely to associate CBD with anti-anxiety benefits, whereas all other age groups associated it with pain relief. Given the varying legal status of marijuana-derived CBD, consumers’ perceptions towards CBD-related advertisements differ depending on where they live. People in the Northeast expressed the most positive outlook, with 70% indicating a favorable perception, whereas in the Midwest only 56% reported as such. Of total respondents, only 7% reported an unfavorable or extremely unfavorable perception. As consumers’ sentiments change, lawmakers continue to express more positive stances, and as new legislation is passed, it will be interesting to monitor overall consumer behavior and consumption habits.